It was Farmer B’s idea to start a club for people to get together and share knowledge and skills about fermenting, pickling, canning, and preserving. Then one night when I couldn’t sleep I sat there thinking idly of potential names, getting nuttier and nuttier in my sleep-deprived brain, and ultimately decided it would be called “Culture Club” (y’know, like the bacterial and yeast cultures that ferment foods…). The basic idea is for people of varying degrees of skill and experience to get together and make stuff, share tips and ideas, and end up going home with delicious treats. There was a lot of chopping. We used turnips, daikon radish, carrot, red radish, burdock root, Jerusalem artichokes (sunchokes), and leeks as the base veggies, and blended up red onion, garlic, ginger, and horseradish for the seasoning. Farmer B had acquired particular Korean chili flakes made especially for kimchee, and we learned how to use them on the fly. We each took home a couple of jars of our spicy concoction (there are mild, medium, and hot variations), and will patiently check them each day to make sure they are still covered in brine while we wait for the miracle of fermentation to work its magic. The whole process is very straightforward but does take a long time (about 4-5 hours for us, not including shopping), which is why it’s great to do with friends! Especially when one of them baked gluten-free chocolate ginger torte and another one brought Cranium Hoopla and you can sit around stuffing your face and playing games while you wait for the veggies to brine. 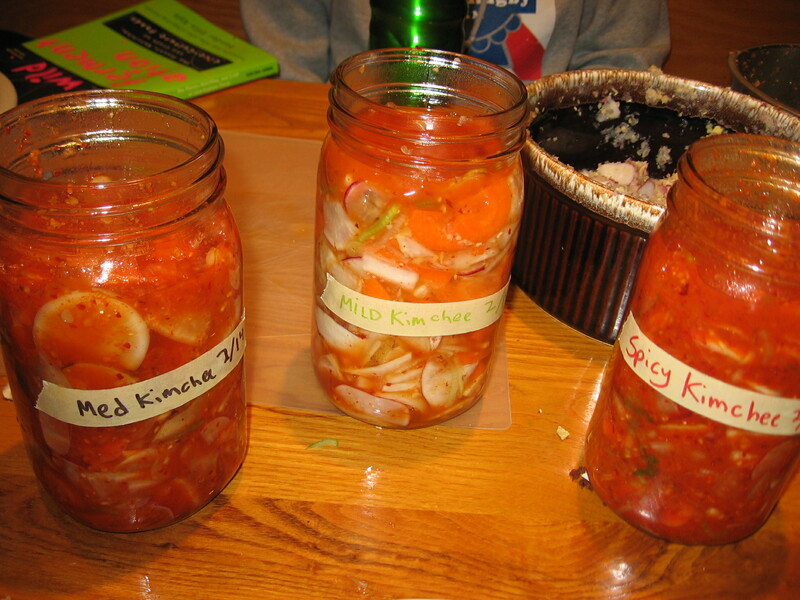 Kimchee would be a great thing to do with any CSA veggies that are fermentable. (I don’t know enough about fermentation to know if some are and some aren’t, or if anything goes.) I definitely started fantasizing about kimchee green beans while we were making this batch, and of course I love the traditional napa cabbage version as well. Never use iodized salt, for the same reason. Non-iodized sea salt is good to use. Things to use as weights: best are glass bottles (in a smaller jar) filled with water or plates (in a big crock) weighted down with a heavy jar or can. You want your weight to be as wide as possible, it should be almost the size of the mouth of your container. Some people use ziploc bags filled with brine (you want brine, not water, in case it leaks), but FB and I feel sketchy about leaching plastic into our food. Make sure to check your batch daily as it sits, as the brine can sometimes evaporate unexpectedly. Any of your mixture above the brine level is in danger of molding, rather than fermenting. If this happens, you can just scoop off the moldy part and toss it, but the stuff still below the brine level will not be contaminated. To add more brine, mix up very salty water – saltier than you would feel comfortable drinking, is a good rule of thumb – and add it to your jar until the brine covers the top of your veggies again. This recipe is from the amazing live-culture foods book Wild Fermentation by Sandor Katz. And of course, though kimchee is traditionally made with fish sauce, this recipe is completely vegan (and naturally gluten-free). 3-4 hot red chilies (or more! ), depending on how peppery-hot you like food, or any form of hot pepper, fresh, dried, or in a sauce (without chemical preservatives!). We used hot chili flakes from the Korean market in the Richmond, with a picture of a kimchee napa cabbage on the label. If you are using these flakes, start by mixing about 1/4 cup with warm water to make a paste, and then add to taste. Kimchee can take a LOT of heat before it gets too spicy, so don’t be shy! Before you begin: I recommend reading the “tips” section above if this is your first time fermenting! 1. Mix a brine of about 4 cups water and 3 tablespoons salt. 2. Slice daikons, burdock, turnip, Jerusalem artichokes, and carrots, and let them soak in the brine. If the roots are fresh and organic, leave the nutritious skins on. Slice the roots thin so the flavors will penetrate. I like to slice roots on a diagonal; you could also cut them into matchsticks. Leave the small red radishes whole, even with their greens attached, and soak them, too. Use a plate or other weight to keep the vegetables submerged until soft, a few hours or overnight. 4. Drain brine off vegetables, reserving brine. Taste vegetables for saltiness. You want them to taste decidedly salty, but not unpleasantly so. If they are too salty, rinse them. If you cannot taste salt, sprinkle with a couple of teaspoons of salt and mix. 5. 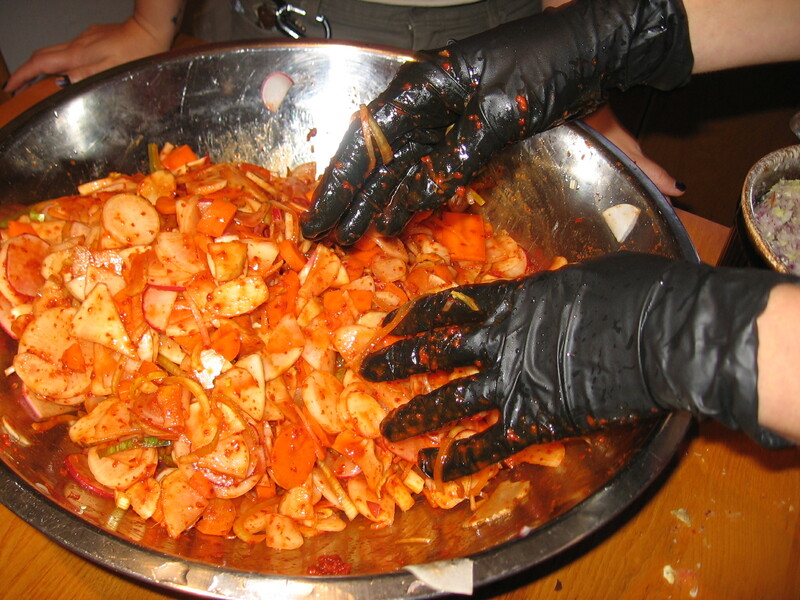 (It’s best to mix and stuff jars with your hands here, but if you are using chili paste you probably want to wear gloves.) Mix the vegetables with the chili paste first, if you are using chili paste, until you reach your desired level of heat. Then mix in spice paste. Mix everything together thoroughly and stuff it into a clean quart jar. Pack it tightly into the jar, pressing down until brine rises. If necessary, add a little of the reserved vegetable-soaking brine to submerge the vegetables. Weight the vegetables down with a smaller jar, or with a zip-lock bag filled with some brine. Every day, use your (clean!) finger to push the vegetables back under the brine. Cover the jar with a clean dishtowel or other cloth to keep out dust and flies. 6. Ferment in your kitchen or other warm place. Taste the kimchi every day. After about a week of fermentation, when it tastes ripe, move it to the refrigerator. 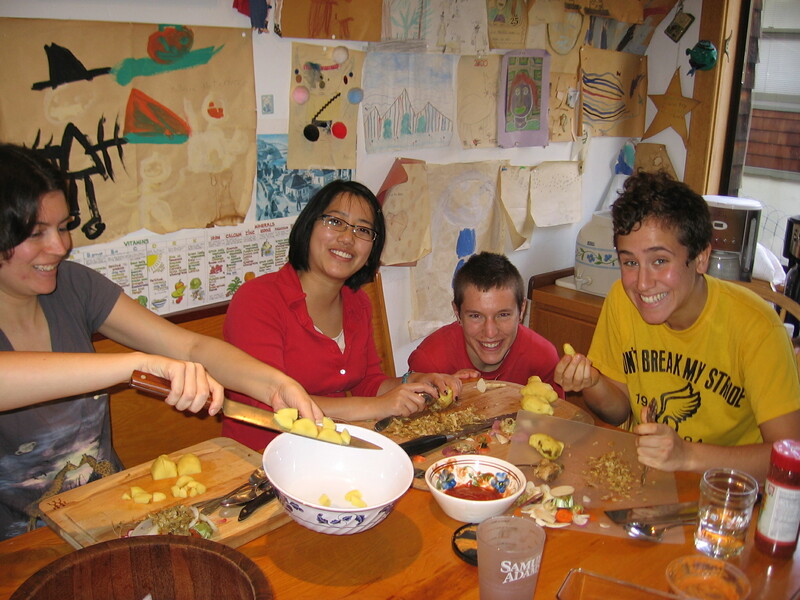 This entry was posted in CSA, Recipes and tagged burdock, carrot, culture club, daikon, fermentation, gluten-free, jerusalem artichoke, radish, sunchoke, turnip, vegan. I want to do this… but I may have questions… Do you mind?? ?